On Wednesday 22nd August I took my very excited almost three year old son and his cousin who is four and a half to see the Teletubbies Live, the Teletubbies first ever theatre show. I was interested to see how this would transition to stage and how engaged the children would be. As we walked into the auditorium it was a feast for the eyes as there were really cool illuminated lighting strips all around the space in the Teletubbies colours which were visually impressive and sure to keep the very youngest audience members amused until the start of the show. The stage was set with a fantastic Teletubbies back drop too. A character called Sam who is friends with the Teletubbies introduces the show and is warm, energetic and very likeable. Along with a voice over as per the tv show and the use of animated backdrops, Sam narrates the shows content and this worked seamlessly. 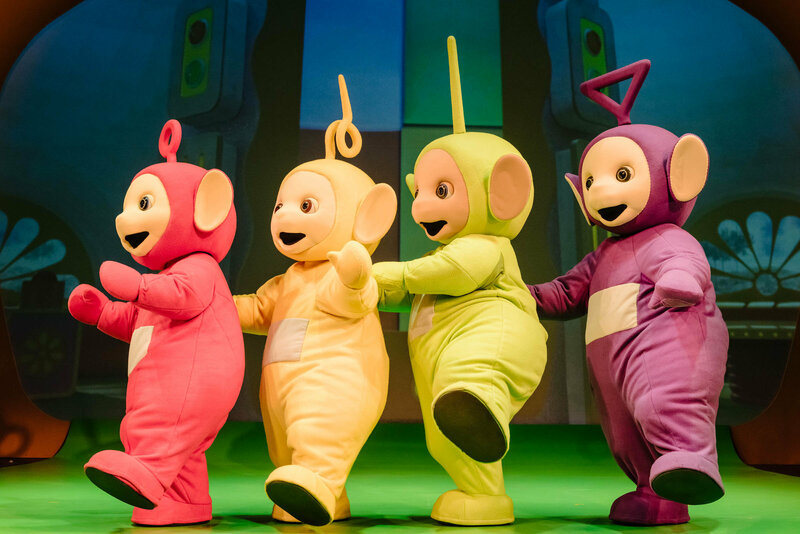 We meet the four Teletubbies in a big song and dance number and also Noo-noo who does a lot of hide and seek which keeps the children entertained. We meet various other characters as the Teletubbies explore the magical world. Sam and Laa-laa dance with a flower and then two flowers have a duet which is well choreographed. Dipsy rides around on a scooter trying to catch the rabbits which are very well puppeteered. Tinky Winky gets in a muddle trying to make toast for everyone, this scene is executed with great use of props. Po counts sheep and there are a couple of fabulous sheep puppets which are again well handled by the cast. Near the end of act 2 there is a lovely song which is also signed and Sam invites the children to join in. It was definitely one of the highlights of the show seeing all of the older audience members on their feet joining in! I really feel that this production lives up to the magic of the tv show and this was made evident by the look on my sons face of pure delight and engagement throughout. The whole audience seemed entranced and were very animated and vocally appreciative. The set was simple and bold and very in keeping. The lighting was very effective particularly in the scenes where surround night light style lighting was used in the auditorium, this was particularly suitable for 0-5s. The Teletubbies themselves looked very authentic and the cast moved extremely well in their very large costumes. I would give Teletubbies Live a five star review, there was nothing I could fault as it did exactly what it needed to do and more. I actually quite enjoyed myself as well (which I didn’t expect) and caught my mum singing along too! To find out if Teletubbies Live will be coming to a theatre near you visit the tour’s website. If you like this review then you might also like reviews of Mister Maker and The Shapes Live, Madagascar The Musical and Tiddler and Other Terrific Tales.